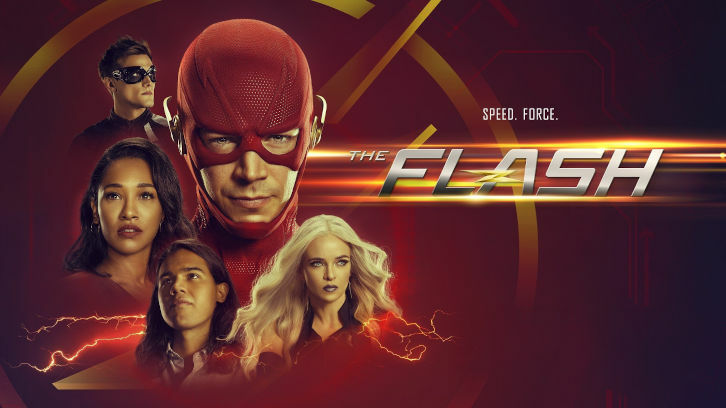 It's no secret the last two episodes of The Flash weren't favorites to say the least. With "Memorabilia", they did a good job of crawling out of my t.v. doghouse. Returning with a powerful combination of laughter, love, and mysteries to be solved, the show proved once again why it still has the power to pull viewers back into the fold. The bad mom who puts a speed dampening chip inside her daughter just to be controlling-that's the Iris the show has been building us up to believe in right? Of course not. That's why so many viewers were puzzled and even put off by Nora's treatment of her mom. The Iris we have known for the last four seasons would never do that just to control Nora. It would have had to be a life or death situation. And with "Memorabilia" now we see that it is. Future Cicada never stops killing metas. So what was a mother to do? I'm sure Barry would have agreed if he was still around-he made that pretty clear earlier this season. "I support your decisions past, present, and future." Then again, even with growth Nora still hasn't quite figured out that lying isn't gonna get her very far with her parents. In fact, she has decided to dig in even more with the lie. And it still hasn't become very clear what Eobard is helping her figure out about Cicada. Like, why is she lying? Team Flash is figuring things out so what is the reason? What has he told her other than how to find her dad that is worth continuing to keep this secret? This better be worth putting a wormhole sized hole in Barry's heart and in turn crushing Iris for hurting Barry. Because no matter how much Barry talks about anyone being able to be redeemed, when he saw the Eobard Thawne mannequin come to life he lost his cool. Nora feels she is lying to protect her family. From what? Or is she just lying to protect herself from their anger? Iris is finally getting her dream fully off the ground. After leaving CCPN and blogging for a while, she has the opportunity to start her own newspaper. The name has the baggage of the crisis headline so of course she tries to ditch it, but she realizes after all is said and done that the future is what the West-Allens make it. This giant leap for Iris is just that-giant. In Flash lore she is such a big part of Barry/Flash's life so there is no turning back for her now. This is great news (no pun intended) to comic fans' ears. Working and solving cases together will make them an even more dynamic duo than they are today. Their outing together served as the comic relief for this otherwise emotionally heavy episode. It was very apparent that with Cisco and Ralph gone (especially Cisco) the show truly lacks on the humor side. From his side quips to his mannerisms, Cisco just has great comic timing, and it was much needed. The Sickada band thing was crazy, and it was also nice to see Ralph really trying to be a friend to Cisco by helping him get back in the saddle and meet someone. It actually worked- hopefully the cute photographer Cisco has programmed in his phone starts working for Iris. Sweet little comatose Grace. What is going on in that little head is actually far from sweet. Now, was it that way before Nora went in there? Not sure. But the way she whispered "I've been listening." like Damien Thorn from The Omen makes it seem like that evil has been brewing for quite some time. The danger here is not only does Grace hate metas like her uncle, she knows Nora's identity. She's been hearing all this hate for months from her uncle and that crazy doctor. If she wakes up now and pretends to be normal, she may become Cicada in the future and no doubt be hunting for Nora. Why did Nora lie to Grace about being a meta? Because she wasn't wearing her mask? If she didn't lie, could that have helped to dispel Grace's idea about all metas being bad? *The memory over a memory idea was very cool. Breaking down the false memories that were built up by anger or fear or whatever defensive walls the characters were putting up was very comic booky. It didn't make a ton of logical sense, but it was heartwarming and played so well by the actors that you could suspend belief for a while to go with it. That's the nature of great t.v.! *Grace is already scarier than her uncle-even as a mean little kid. Imagine what she'll be like on the streets. She's prepping and training in her mind. Her defense mechanism version of herself is a beast! Orlin's Cicada is so lame. *Grace also has Nora pegged- she is a big ole liar. Sorry not sorry. *The whole room gave Nora the side eye for her bull-spit explanation of using the memory machine alone. Nora, your mom is a REPORTER BOO! She is gonna find out you are lying if no else does! Plus Sherloque has already tipped her and Barry off. Barry is secretly pissed she used Thawne as the defense mechanism. He and Iris better talk about it! *It does not seem that Iris told Nora Barry was The Flash til she was older. Nora's fixation with The Flash as a hero of her dad's began at a much younger age giving Thawne a huge opening. Nora wanted to know The Flash, but he was gone and she presumably didn't know her uncle was one either. This may be how Thawne was able to gain her trust- he is a version of Flash who actually knew the real one. Thawne presented himself as everything the real Flash was so of course this was intoxicating to Nora. Now she can't let him go that easily. Can't wait to hear how this actually played out. *Scientist Barry, where are you hon? I need you to hack Gideon (Ask Cisco to help you if you just need to- I can live with that) and get Nora's secrets out of there m'kay? You might not even need to hack her. She will just tell you- hell you're Barry Allen- you created her.You don't need to be blind sided by her betrayal. I know you feel it. I can't take those eyes and the face you're gonna have and the tears when you tell Iris. *Speaking of Barry, him nerding out in The Flash Museum was really geeky and cute, but he has to face the fact that his disappearance may really happen. Not get bogged down and talk about it every minute, but address it meaningfully with Iris, Joe or maybe even in a personal log like Gideon. *The Grodd comic book! He's coming back!! *The Batman villain Easter Eggs- They are teeing up the Batwoman series. *The family scrabble scene was adorable. And not without some hinting. The board had the words brother and faster on there. More diapers indeed.The ice-skating scene was the cutest! Tom C. was killing it on the skates! *West-Allen together in Iris' new office was sweet, but we all know Barry would not pat Iris on the shoulder after popping a bottle of champagne for this huge career milestone. Really? If a kiss or hug from that scene ended up on the edit room floor, something else should have gone there instead. "Memorabilia" was a nice swing back to The Flash formula that makes it a success. Here's hoping the rest of the season keeps it coming. The Flash airs Tuesday nights on the CW. As always, thanks for reading. What did you think of the episode?